Dickinson County lists the steps required to obtain physical copies of vital records by mail on the County Clerk website. They also offer a research area in the Clerk office for up to two genealogists at a time. They have birth, death, marriage, and divorce records, all dated from 1891 to the present, along with naturalization records from 1892 to 1970. All the records stretch back to the year the county was formed, in fact. The Clerk's office, located in the county seat of Iron Mountain, opens at 8:00AM and closes at 4:30PM on weekdays only. 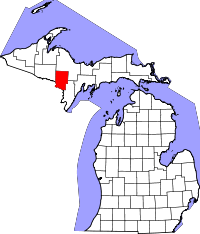 Dickinson is one of the smaller counties in Michigan with regards to population, with about 26,000 residents as of the 2010 census. The county was named after Don M. Dickinson, the U.S. Postmaster General in the late 1800s. It is located in the northern half of Michigan and borders Wisconsin. Note: County plans to have Register of Deeds records online, but no set date.